The state of aircraft carriers, or more correctly, aircraft-carrying ships in 1916 was such that a large and heavy aircraft such as a torpedo-bomber might be able to take off given enough headwind, but not land again on the small 'flying-off' decks of the time. Floatplane operations required the ship to stop in potentially dangerous waters. Blackburn's Blackburd (an archaic Scottish spelling) was designed to take off from a ship, jettison its wheels (quickly so they could be recovered) and then its axle so the torpedo could be dropped. At the end of its mission, it was to ditch next to the ship and hopefully be recovered. The Blackburd proved unstable in pitch, being nose heavy with or without a torpedo, and the rudder was ineffective, making deck landings virtually impossible. This is the ugliest airplane I ever see!!!!! � The four interconnected ailerons could also be used as flaps for take-off and landing. � The Blackburd had a simple cockpit for a pilot only. Later practice was to have multiple ctew on all shipboard aircraft to handle navigation, communication and self-defence. � The undercarriage was quite complex, being designed to come apart in various ways so the Blackburd could land on water or land using skids. The main legs were highly sprung and very strong to withstand heavy landings with no axle support. � Just after take-off a lever in the cockpit released the wheels and returned the aileron/flaps to the neutral position. The same lever released the torpedo retaining straps and started its motor prior to dropping. � The Blackburd was designed for easy mass production, with a box-like fuselage. 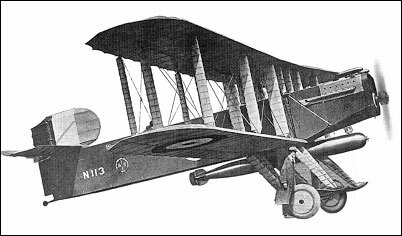 The first aircraft had a tapered cowl, but the subsequent two were completely rectangular.